Goulburn-Murray Water is entering the New Year on a high note, with water storages averaging a healthy 80 per cent and Victoria’s highest capacity dam – Dartmouth – just under 90 per cent full as of the first week of January. “These figures bode very well for water security over summer and, indeed, throughout 2018,” GMW Managing Director Pat Lennon said. “You only have to go back a short time when GMW and its customers would start off the calendar year with some trepidation on how water availability would hold up during the warmer months, when demand typically reaches its peak. “For example in 2015, our storages were less than half full at 47 per cent which placed added pressure on our operating region, which covers about a third of Victoria and manages 70 per cent of its stored water,” Mr Lennon said. “Of course we’re mindful that the most recent ‘top up’ of our storages came at a cost for many, with record rainfall in the opening days of December causing damage across the Goulburn-Murray Irrigation District and in the north-east. Mr Lennon said he was pleased to report GMW will enter 2018 with good news on other fronts, in particular its firm plan for the future. “For more than a year we’ve worked with our customers, stakeholders and communities on our Strategic Plan, which provides clarity on how GMW not only remains sustainable over the next 5, 10 and 25 years, but more than meets the expectations of all,” Mr Lennon said. 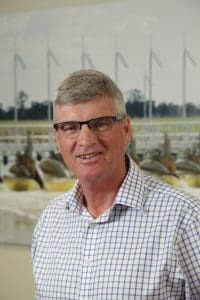 Mr Lennon said the future challenges of water availability, climate change and the unknowns of an increasingly global market for many customers, make partnering with the communities of northern Victoria and actively contributing to regional development more important than ever. “Our Strategic Plan reflects these goals and challenges,” Mr Lennon said. “We know GMW must become more agile and more efficient in our changing environment and we are already implementing initiatives in order to meet these goals. Mr Lennon said customers could enter 2018 with confidence GMW was addressing the region’s long-term future in its strategic planning.